What’s the Best Kitchen Countertop: Corian, Quartz or Granite? HomeKitchen RemodelingWhat’s the Best Kitchen Countertop: Corian, Quartz or Granite? If you find yourself contemplating a kitchen remodel, the choice of countertop material will certainly be a major decision you’ll have to make. At McDaniels Kitchen and Bath, we know this decision should be taken seriously. Of all the potential materials you have to choose from, Corian, quartz and granite are definitely strong contenders. As kitchen and bath remodeling experts, we’ll go over some of the advantages and disadvantages of these materials and help you decide which one might be right for you. Honestly, any of these three countertop materials would be right at home in a kitchen that’s designed for luxury with high-end appliances, cabinets, fixtures and flooring. Luxury is a fairly broad term. They’re all fairly luxurious, but you may be looking for specific qualities beyond this. If you want a clean, consistent finish, then Corian or quartz will be your best bet since they’re fabricated and, therefore, can offer you a specific color or pattern. However, granite will be preferred by many because it is the exact opposite of this with its naturally occurring inconsistency of patterns and colors. When you want maximum flexibility in the variety of colors, you’ll want to go with Corian or quartz. For luxury reputation, though, it’s hard to beat granite or quartz. This is a practical criterion for which of these materials will stand up for the long haul through day-to-day living in your home. Do you have kids who might put a hot pot on the counter without thinking or spill something that has a reputation for staining and leave it there who knows how long? Because of granite’s porous nature, quartz and Corian will be a notch above it in this low maintenance and durability challenge. Which Is Best for an Eco-Friendly Kitchen? Few of us fail to consider how our decisions impact the environment today. When it comes to sustainable manufacturing processes, quartz is the winner. Much of the quartz used in countertops is made right here in America, so this means less fuel is burned getting it to our kitchen and bath showroom at McDaniels so you can bask in its luxuriance while seeking inspiration for your new countertops. Corian’s manufacturing process requires toxic chemicals, so that keeps it out of first place in this category. The mining practices used in the extraction of granite plus the energy that has to be expended to get it to the U.S. makes it the worst material on the sustainability front. As mentioned in the luxury section, quartz and granite have more of a luxury reputation than Corian. People pay for this reputation, which makes Corian generally a little more affordable than the other two. 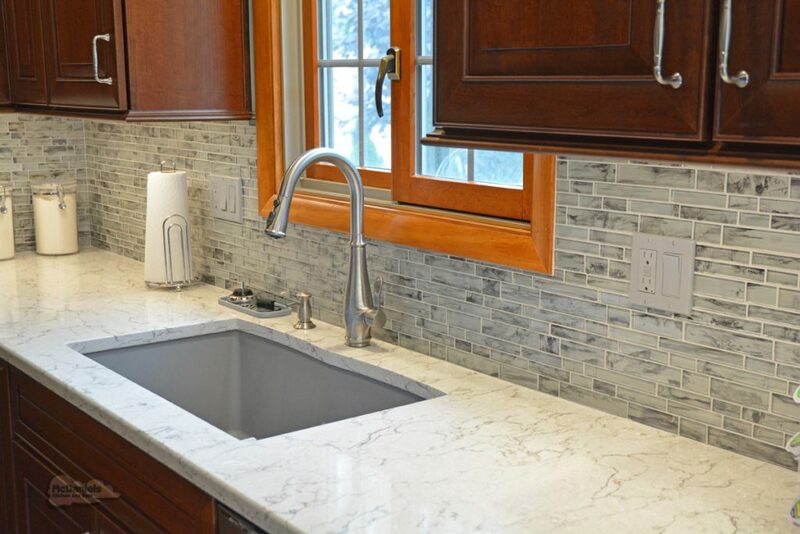 Quartz typically takes the top spot when it comes to high cost. If you’re confused by all the options in countertop materials, that is why McDaniels Kitchen and Bath exists. Serving Michigan for decades, our Lansing showroom will provide you with inspiration, and our knowledgeable staff will give you direction for finding just the right countertops or any other products you need for your kitchen or bathroom designs. We showcase the latest design schemes, and you’ll see how the product and material choices you make will work together in your home.